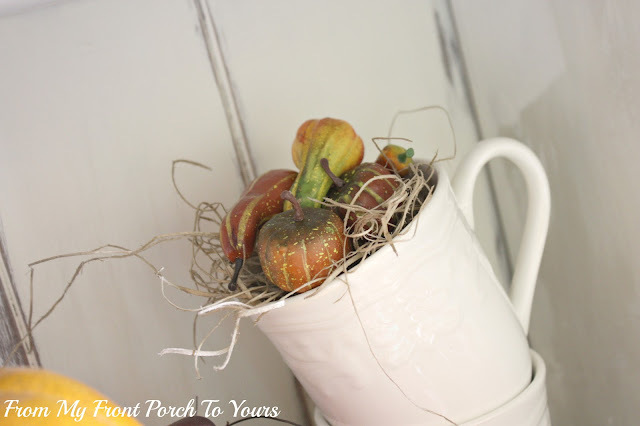 This morning there is a crispness in the air and I am having my first pumpkin latte of the season while making this post. It is yummy! Up next in my series of fall decorating reveals is our dining room. I know some of you...Mom;)...did not like my choice in removing our antique buffet out of the dining room and replacing it with the frenchy hutch but I have to say that I am really loving it in here. I may just have to let that buffet go to its next home. I know Mom is just cringing right now. Sorry Mom. The hutch has been so much fun to decorate. I am really glad I removed that top shelf. 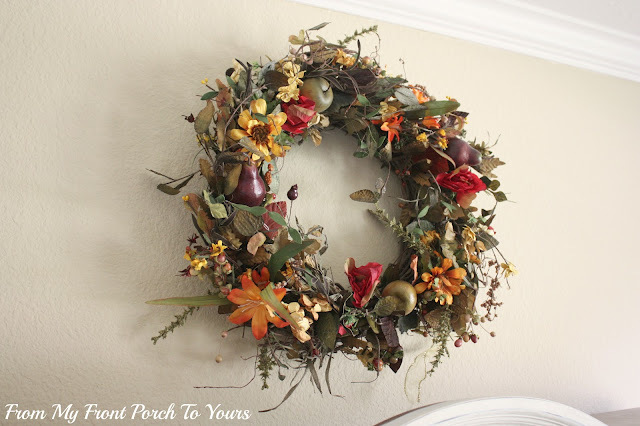 I wanted to add some height to the hutch per say so I went digging thru all of my fall decor and came up with this wreath that I purchased last year from HomeGoods. I had used it above our fireplace. I pulled down this clock from above our front door. It was too tall for here at first because it has a spindle on the top but thankfully it just unscrewed so it all worked out. I love when things go as planned! I may change this space up a little but for now I just used some pretty pumpkin picks to spice things up. I left my white dish ware out because it is so versatile. I added the center pumpkin and then a few flowers in the pitcher. I also added a little something to the cups. They were originally empty but after staring at them for 30 minutes I HAD to put something in them. I am really loving how the centerpiece for the table came together. I was racking my brain trying to think of what I could do here. I didn't want to go out and spend any money. You may think that this pumpkin piece looks vaguely familiar. I had put the base together back in the spring. While I was putting the bunny on a stick display away it dawned on me how great the base would look with a pumpkin stuck in the middle. Thankfully the bunny stick was removable. To make it look more fallish I added the leaves in with the greenery. I think it came together beautifully. 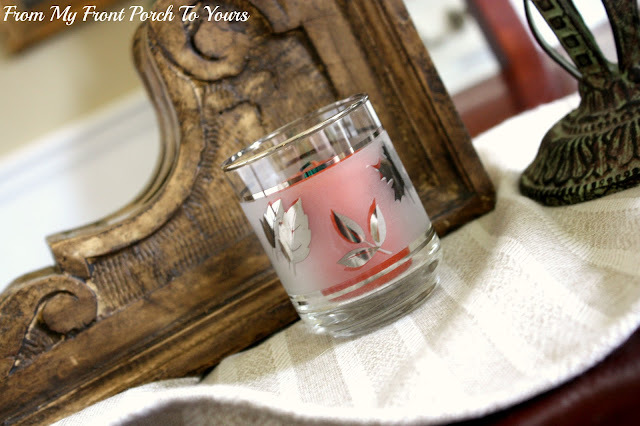 I adore these leaf votives and bring them out every year. My mom gave them to me after The Hubster and I were married. I may be corrected but I believe these belonged to my grandmother. If not they were my Mama's so either way they will always be special to me. Instead of candles I placed these .99 cent WM pumpkins on the top of my iron candle sticks. The only thing I did buy this year for in here. I then added the candle rings for that extra pop of color. 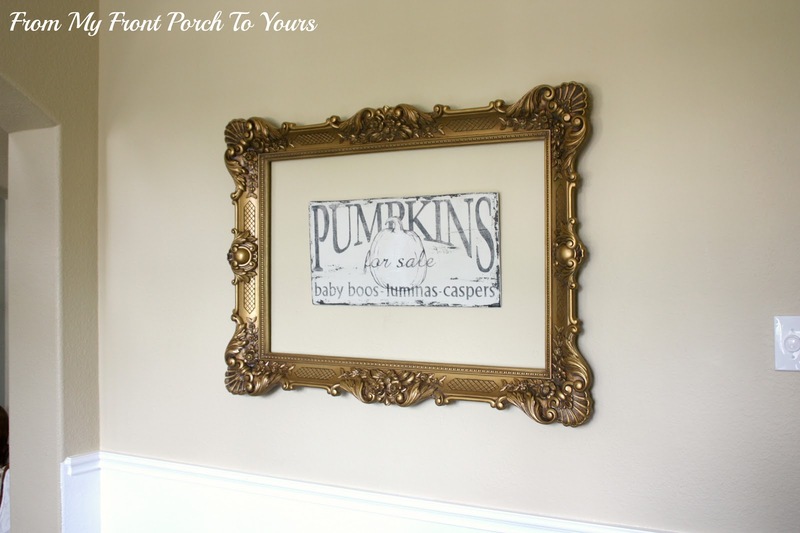 I have not had a chance to make this large frame in to a chalk board yet so I just placed my "pumpkins for sale" sign inside of it. I hope I can change it out shortly. Gotta get The Hubster on board though to cut the board for me. Thanx for stopping by! Up next in the fall reveals I think will be our outside. Love the fall dining room! I am inspired- getting my hutch and maybe mantel done up today! B E A u T I F U L! You did a great job. I'm still ooohing and ahhhhing over your hutch. I just love the white with wood tones! Happy Sunday! Got my mantel done today.. the last thing to accomplish. YEAH!! 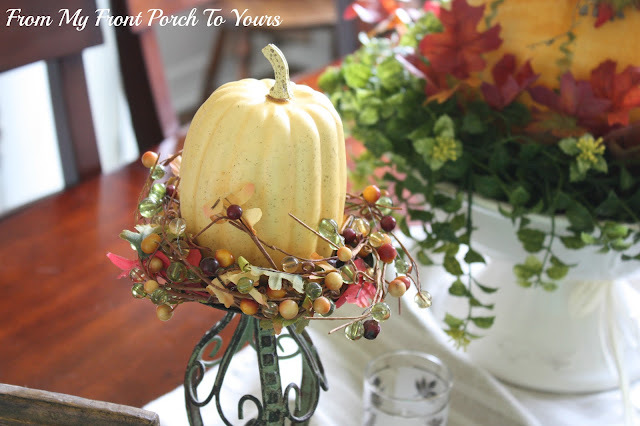 You really went all out, decorating your dining room for fall! Job well done!! Pamela, your dining room looks wonderful! 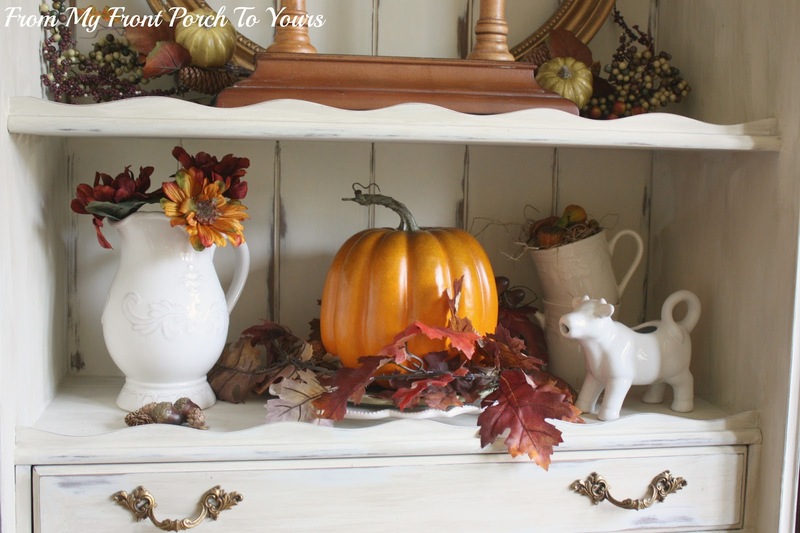 Love all of the fall touches in your hutch! Very pretty! It all looks great, Pamela! I love your hutch too! You did an amazing job decorating for Fall! I see lots of inspiration! Everything looks pretty and festive, Pamela! I so love your French hutch and you must have had a lot of fun decorating it! 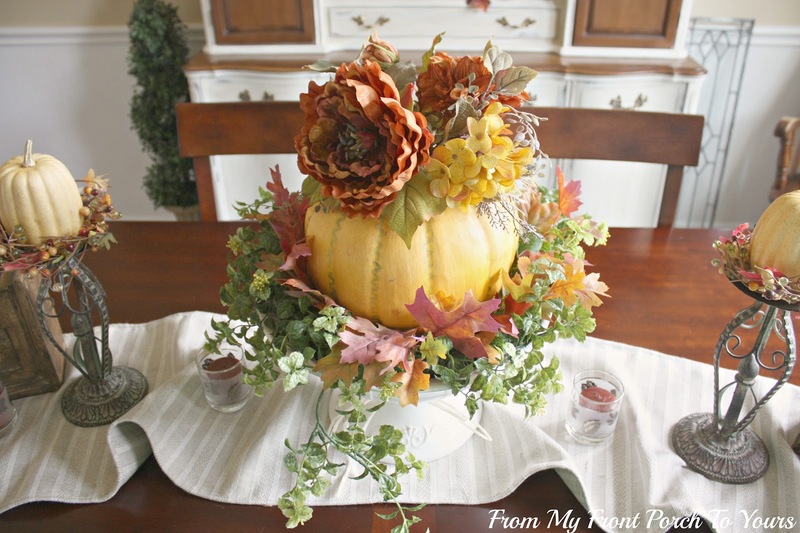 You did a great job on the centerpiece...nice that you could change it from spring to fall! Very pretty, Pamela! I'll bet you are having a great time decorating that hutch piece. Love the table centerpiece! 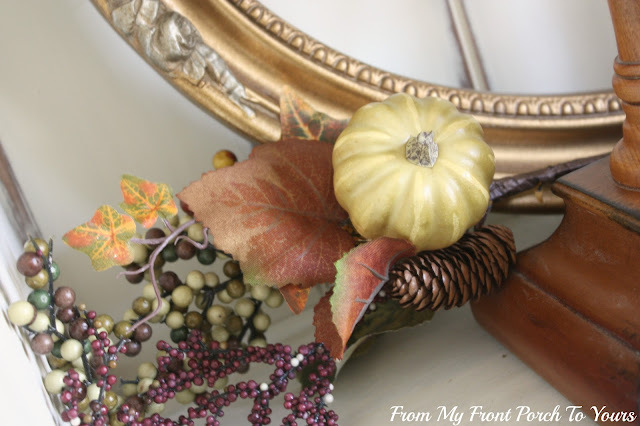 Great Fall decor! I especially like how you carried the pumpkins from the hutch to the table. Love the frame! So warm and inviting!!! I just love how the hutch turned out you talented chick! Beautiful job Pamela! Your hutch looks FABULOUS!! 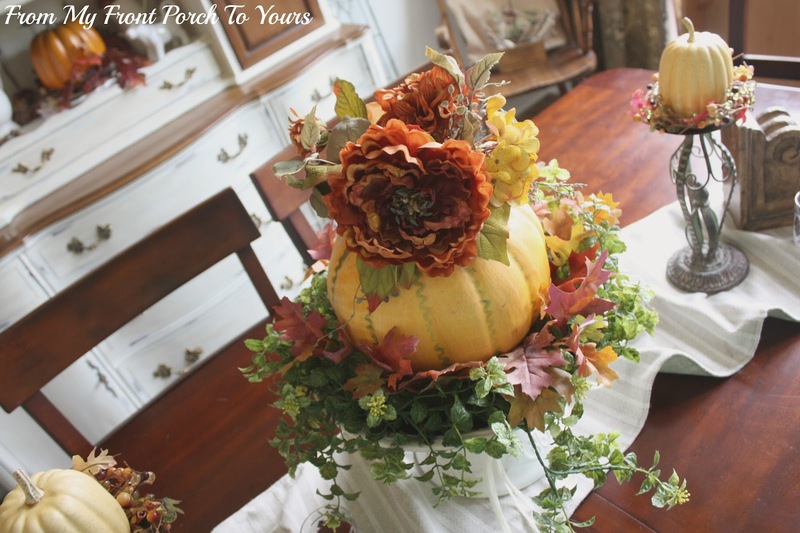 Pamela...beautiful job in creating such a wonderful Fall dining room....looks fantastic!...love the pumpkin centerpiece! Everything is so beautiful...love the hutch. Pamela, your dinning room looks gorgeous! I love all the decor on your hutch and the wreath over it just finished it off so nicely! Very pretty! Beautiful ! Love the hutch ! Everything look beautiful. I love the table the centerpiece and candleholders are beautiful. The pumpkin sign in very pretty. I love the French hutch, Pamela. My mom cringes when I change something she likes, too! 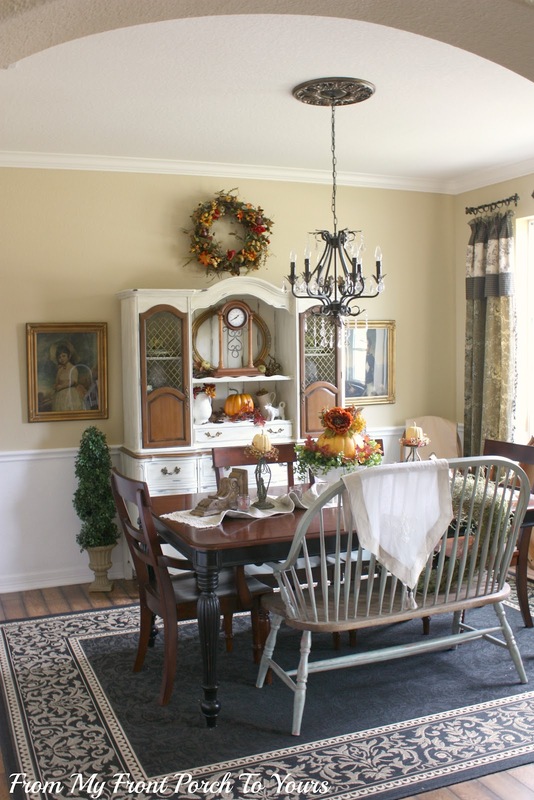 Wow - your dining room looks so pretty it all its Fall splendor! Great idea to hang the wreath above the hutch. It really draws the eye to the hutch. 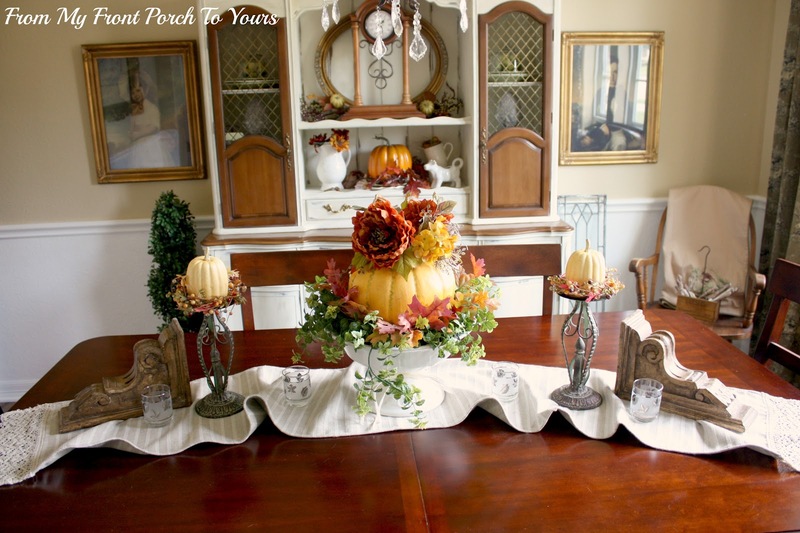 Your dining room looks fantastic all dressed up for fall! Love the bench! Beautifully done! The arrangement on the dining table looks great. Your hutch looks good with the clock in the center! Great accents all around! 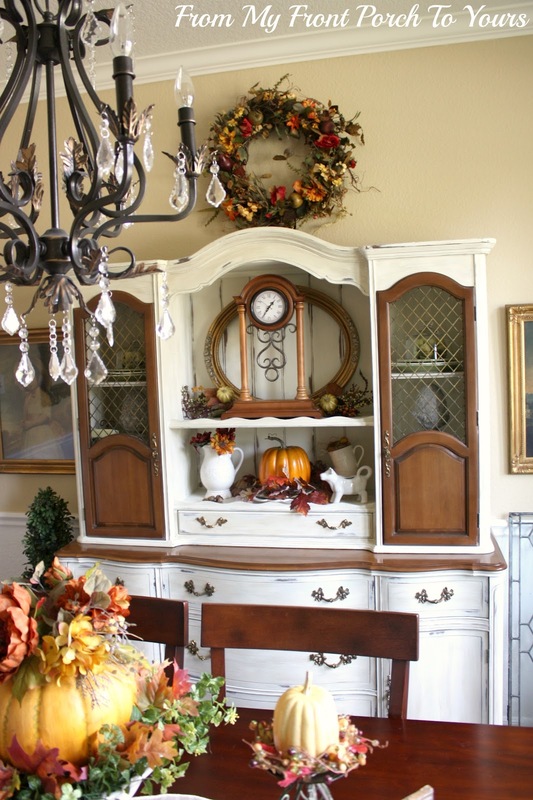 Pamela, You certainly made the right move by putting this gorgeous french hutch in your dinning room! I love that it is painted and stained! What a great combination! And you have filled it so beautifully with fall finery! 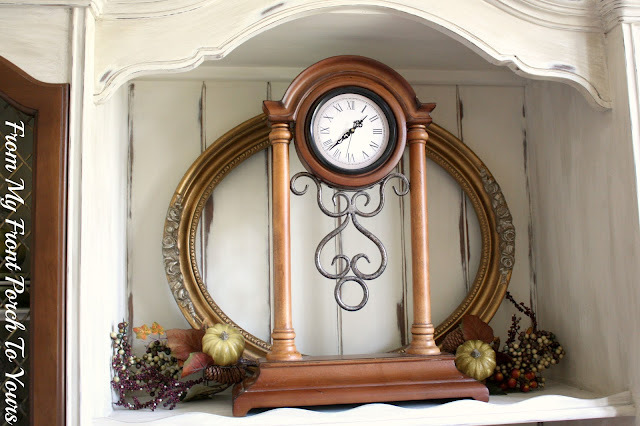 The clock makes a great statement in your hutch! Your pumpkin sign is like icing on a cake... it if the perfect detail for your fall dining room!s Aren't you glad you did not made it a chalkboard yet! I know I commented on your FB post, but I just have to say it again... BEAUTIFUL! It's so warm and inviting! I just love it, Pamela!! What a great dining room! I love the hutch all decked out for Fall and love your pretty centerpiece! I love your pretty dining room and all the lovely details. Pamela, your room is just gorgeous!! I love the hutch too, and so nicely decorated. Looks like such a wonderful place to enjoy!! Thanks for stopping by, and I will try to link up to the party!! Very pretty! Love the frenchy hutch and bench at the table! Beautiful job in your dining room with the bench and hutch. Such a soft inviting look. Your table really looks lovely. Very elegant and graceful. Your dining room looks so homey and welcoming, cheerful and seasonal. Well done! Beautiful setting! Too funny about your mom. I am actually the same way. I love "doing" furniture, but for the most part, my heart belongs to primitives so I don't actually have a lot of my own furniture, but each time I do a piece, I keep thinking that I should find a place for it in my own home. I've always thought your hutch was so creatively done so I'm glad you are using it! Gorgeous Pam! You decorations are so pretty! I love the pumkin sign in the frame. Very fun!